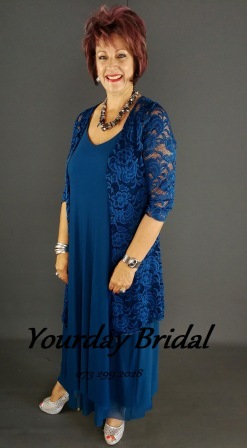 Mother of the bride or groom mesh dress and lace jacket available at Yourday Bridal in baby blue size 38, wine size 38 and magenta size 40, and navy blue. Yourday Bridal tel: 012 653 0318 or 073 299 2028. 104 Willem Botha Street, Eldoraigne, Centruion, Gauteng.